For some Americans, minimum wage jobs are temporary. For instance, teenage jobs where one busses tables and takes orders to make quick spending money. However, often times people use minimum wage jobs to support families. As of 2011, more than 3 million Americans worked jobs that paid minimum wage. Someone who is being paid minimum wage and working 40 hours a week will only make about $15,000 a year, leaving them below the federal poverty line. The last time the federal minimum wage was raised was in 2009, where it increased from $6.50 to $7.25 an hour. According to minimum-wage.org, raising the minimum wage and indexing it to inflation would allow millions of Americans to adopt a standard of living that most resembles the current economy. Raising the minimum wage will increase economic activity and spur job growth. The Economic Policy Institute states that increasing the minimum wage to $10.10 would inject $22 billion dollars into the the economy and would create about 80,000 jobs in a three year period. Additional income would be spent by consumers, and that money would ripple through the economy. More importantly, though, there would be an increase in the standard of living for many Americans. According to the Congressional Budget Office, raising the minimum wage to $9.00 would raise at least 300,000 Americans out of poverty and give them a chance at a better life. Doing this would create many beneficial outcomes such as lowering the crime rate and increasing graduation rates. Money and basic living standards are necessities that make tasks as simple as graduating high school so much easier. Those against raising the minimum wage suggest that a sudden substantial increase in pay would have negative effects on the economy and, generally, they are correct. The minimum wage will need to be increased gradually to give the economy and businesses time to adjust. For example, in California a law was passed to gradually increase the minimum wage from $7.25 to $15 over the course of five years. The law allows the governor to put a hold on the increase if the economy appears to be faltering or if the state’s budget becomes tighter. Furthermore, the law also states that the governor must look at an economic assessment every year to decide if the next scheduled increase should take place or not, depending on the state of the economy. These provisions ensure that the economy will remain stable while wages are being increased. In general, some people just don’t have the resources or skills necessary to ever get promoted from a minimum wage job. It’s a vicious circle when the impoverished are reduced to a life of crime and eventually drop out of high school. The fact that they don’t have money to begin with makes it more difficult for them to make money in the future. Raising the minimum wage would invest money in not only the currently impoverished, but prevent future Americans from living in the same standards. It’s selfish to suggest that hardworking people who perform “menial” tasks shouldn’t be paid a living wage. Their jobs are essential and vital to daily life of all people in America, most of them doing jobs that others don’t want to do. So why is it that we refuse to increase pay to the people who do these unwanted jobs? Like any other hardworking employee, those in minimum wage jobs should be paid at least a living wage. It’s not just teenagers working these jobs anymore, it’s adults, men and women, who need to provide for their family. However, I’m not suggesting that every state immediately raise the minimum wage to $15 an hour. Companies and employers need time to adapt, just like the economy, but raising the minimum wage incrementally over time will only benefit Americans as a whole. Point blank, raising the minimum wage would be very detrimental to our economy. As much as we would like to think that this could save our financial declinations for (mostly) the millennials, this would make it worse for Generation X, the Silent Generation, Y, Z, the Baby Boomers- all of us! As much as we would love to make $10.10 per hour working fast food, unless you’re a manager, it is often implausible. This phenomenon of continuously raising the minimum wage has way too many problems to come out as a success. As reported by stateofworkingamerica.org, the 1960’s $1 was equivalent to 2011’s $6.65. Where our minimum wage has increased twenty two times, it keeps inflating the value of the dollar. Raising the minimum wage would lessen the motivation to advance in one’s career. According to The Motley Fool, wages have increased over 39%. If we were to increase them even more, we would be right back where we were. Jobs paying minimum wage were not created as a primary source of income. I’m not taking away the difficulty of such employment, but it was not meant to be a permanence. Moreover, minimum wage jobs are almost inevitably not enough to support an entire family comfortably. According to poverty.ucdavis.edu the annual average of earnings for a minimum wage worker is around $15,080. For those in favor of the statement, “well, raise it!” many companies cannot afford to pay their workers any more than they already do with their hefty demand and lack of experience, in some cases. Most minimum wage workers are in the high-school age bracket, like myself. I work for $7.25 an hour where our projected labor is approximately 22% of what the store is permitted to spend after profit. If we were all forced to be paid $10 an hour, we would have to significantly cut our staff down each night to where we all work impossibly hard each day. The ten people working each shift would then very well be forced down to about six. How could we keep up with the desired product? Our business would then be forced to significantly slow down. What happens when a business slows down? No one makes any money and businesses fail. If the minimum wage were to be increased today, as many jobs would be decimated as there would be people with puppy-dog eyes begging on doorsteps only to be laughed at. 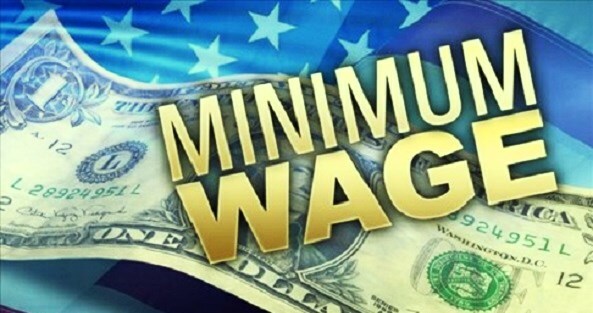 In the state of Indiana, the minimum wage is $7.25 an hour. One of the biggest grievances surrounded by minimum wage is comfortable living, but what is failed to be understood is that if we are all paid $10 or $15 an hour, milk (for instance) will not become cheaper, but rather it would proportionally change with the forced increase in variable cost. Again, the value of the dollar is decreased. In purchasing milk and other products, the cost of capital needed for achieving these products can, will, and has dramatically increased after continuously raising the minimum wage. We see the simplicity of everything we use on a daily basis, but we easily take how it gets there for granted. Think about your gallon of milk for a second. Everything from the plastic bottle container to the cows’ food is now variable cost in conversation. Back in the day, we used glass and no ink. We use more advanced, quicker processes of making things, but since, more is involved. To start, we need cows to produce this milk. What do we feed these cows? We ask many more questions about their diet how to attain their diet, where they’re kept, and how they’re cared for. Then, we need a factory to produce the plastic to store our milk. What is plastic made out of? How does your milk get to your doorstep? We and the truck drivers delivering your milk to your local stores must get gas or electricity to fuel their cars, but what happens when we can’t afford any of those things? If we raise the minimum wage, all of the following workers could potentially be out of work if labor is very tight or controlled. What happens then? In the state of Washington, the minimum wage is $9.47 an hour, where the average cost of a combo meal would be approximately $8. In Indiana, the average cost is $6. Our grandparents remember when milk was around $.49, but if Kroger charged half of a dollar for their milk now, they would be losing money. That was not always the case. Moreover, if we are considering the argument that it will adjust over time, what’s the point. Overall, the proposed advantages to raising the minimum wage are very quick to be outweighed by the negatives. As much as we want this to be the solution to helping all of our low-income families and workers have a better life, increasing the minimum wage is not the solution and never has been.